ACDS Admission 2018 will be conducted on the basis of the NEET 2018 Exam conducted by CBSE. 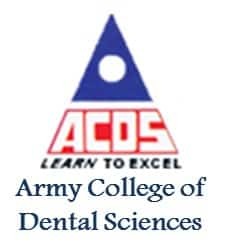 Army College of Dental Sciences (ACDS) was established by Army Welfare Education Society as a centre of excellence for Dental Education. It is a private un-aided and Non-Minority educational Institution. ACDS allows admission to the candidates on the basis of NEET 2018 Scores. ACDS Admission 2018 is only for the children of Army personnel and war widows. The candidates will get admission to the first year of the BDS degree course at Army Collge of Dental Science (ACDS), Secunderabad and B.Sc Nursing Admission at ACN Jalandhar and AIN Guwahati. B.Sc Nursing is only for admission to female candidates. Admission to the first year of the B.D.S degree course at the Army College of Dental Sciences, Secunderabad for 34 seats will be on UG NEET merit basis. Remaining 06 seats will be filled by Kaloji Narayana Rao University of Health Sciences, Warangal(Telangana). Six seats will be filled from TS EAMCET merit candidates by Kaloji Narayana Rao University of Health Sciences, Warangal (Telangana). Army College of Dental Sciences (ACDS) Secunderabad.- Affiliated to Dr NT Rama Rao University of Health Sciences, Vijayawada, Andhra Pradesh. Army College of Nursing (ACN) Jalandhar - Affiliated to Baba Farid University of Health Science. Dependent children of serving army personnel, ex-army personnel and widows of the India Army are eligible for ACDS admissions. The eligibility criteria for BDS and B.Sc Nursing course is different. Candidates can check the eligibility criteria below. Candidates must have passed or appearing Class 12 or equivalent exam in March/April 2018 from a recognized board with Physics, Chemistry & Biology as the subjects. Candidate should have obtained at least 45% in each of the subjects. Candidate must have scored an aggregate of 50% marks in Physics, Chemistry, and Biology. Candidate should be a minimum of 17 years by the 31 December of the year of taking Admission. B.Sc Nursing is exclusively for female dependent wards of serving Army personnel, ex-army personnel, and war widows. In AIN Guwahati, 5 seats are reserved for Civilians from North East Region. ACN Jalandhar: The candidates should not be less than 17 years and not more than 25 years on 31 Dec 2018. The ACDS admission is done on the basis of NEET scores. The candidates who want to appear in NEET exam need to fill the NEET Application Form. However, the candidates also need to fill the ACDS application form in order to apply for the admission in Army College of Dental Science. Candidates who want to apply in more than one institute must purchase separate application form for each. However, the filled application form for all the three institutions must be submitted to ACDS, Secunderabad. Army College of Dental Sciences, Secunderabad. AWES (Army Welfare Education Society), Adj. General's Branch, Integrated HQ of MoD (Army), Building no. 202, Shankar Vihar, Delhi Cantt- 110010. The application form can be downloaded from the links given above and the filled up application form has to be accompanied by a demand draft. There is a common application form for admission to all the three institutes but the application fee is different. The candidate has to attach the attested photocopies of the following documents. Certificate of passing the (10+2) CBSE/equivalent qualifying examination. Mark sheet of passing the (10+2) CBSE/equivalent qualifying examination. Photograph – Stamp Size – 08, Passport Size – 08. Medical Certificate in prescribed format at the time of counselling (Certificate -6). Application form duly completed in all respects for all the three institutes should be sent to the following address along with all the documents listed above. Candidates have to pay the given below application fee for the admission to the ACDS Application filling. Tuition Fee Allied charges Rs. 2,99,500 - Option to pay in two installments is also available. It is the total annual fees for B.Sc Nursing inclusive of hostel charges. In addition, the candidate will also have to pay Registration Fees and Migration Fees as per the university rules. ACDS Result of the merit Listed candidates will be declared on July 1st week 2018. Candidates can check results from one of following ways. At all the Command Headquarters. At all the Headquarters conducting admission test. Successful candidates will also be intimated by post. However, it is advisable to keep a check on results. Counselling will commence from July 1st week 2018. Candidates will be called on the basis of their merit in NEET UG. ACDS Counselling will be strictly be based n the merit of NEET 2018 Scores. Following documents in original are required to be produced by the candidate at the time of the counselling. The presence of the candidate is mandatory at the time of Counselling. PPO In original (for verification only). Medical Certificate in prescribed format at the time of counselling. Undertaking by parents and students (As per Appendix`C’ in Application Brochure) to be produced at the time of counselling only. There will be only one paper in NEET entrance exam, which will be conducted in Pen and Paper mode. If you have any query regarding ACDS Admission 2018, you can write in the comment section below.